BENJAMIN, Judah Philip, a Senator from Louisiana; born on the Island of St. Croix, Danish West Indies (now Virgin Islands), August 6, 1811; immigrated to Savannah, Ga., in 1816 with his parents, who later settled in Wilmington, N.C.; attended the Fayetteville Academy, Fayetteville, N.C., and Yale College; moved to New Orleans, La., in 1831 and taught school; studied law; admitted to the bar in 1832 and commenced practice in New Orleans; elected to the lower house of the state legislature in 1842 and served until 1844; member of the State constitutional convention in 1845; elected as a Whig to the United States Senate in 1853; reelected as a Democrat in 1859 and served from March 4, 1853, to February 4, 1861, when he withdrew; seat declared vacant by Senate resolution on March 14, 1861; chairman, Committee on Private Land Claims (Thirty-fourth through Thirty-sixth Congresses); appointed Attorney General under the provisional government of the Confederate States, February 1861; appointed Acting Secretary of War of the Confederate States in August 1861 and served until November 1861, when he was appointed Secretary of War; served in this capacity until February 1862, when he resigned to accept the appointment as Secretary of State in the Cabinet of President Jefferson Davis, in which capacity he served until the end of the war; moved to Great Britain in 1865; studied English law at Lincolns Inn, London, was admitted to the bar in that city in 1866, and practiced law there; engaged in newspaper and magazine work; received the appointment of Queens counsel in 1872; retired in 1883 from active practice and public life; moved to Paris, France, and died there May 6, 1884; interment in Pere la Chaise Cemetery. American National Biography; Dictionary of American Biography; The Yale Biographical Dictionary of American Law; Evans, Eli N. Judah P. Benjamin: The Jewish Confederate. New York: The Free Press, 1988; Osterweis, R.G. 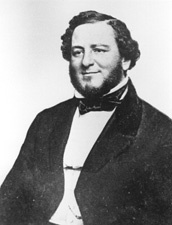 Judah P. Benjamin, Statesman of the Lost Cause. New York: G.P. Putnam's Sons, 1933.